Here’s something a little different to do in Raja Ampat over the next few weeks: Join local communities and the crew of the research and education vessel Kalabia at outdoor screenings of the acclaimed Blue Sphere Media film Guardians of Raja Ampat. The events are sure to provide a festive night out as local communities gather to see the film and enjoy live performances by Edo Kondologit – a hugely popular musician from Sorong, famous for his anthemic songs of Papua. Produced in conjunction with Conservation International by Emmy Award winning cinematographer, investigative conservation journalist and 2011 Oris Sea Hero of the Year Shawn Heinrichs, the film is a visually spectacular telling of the stories of the island community members and organisations who are the true guardians of Raja Ampat. The desires and aspirations of local communities provide the foundation for and the only real chance of success of the international conservation effort in Raja Ampat. Guardians of Raja Ampat clearly and beautifully illustrates these truths. 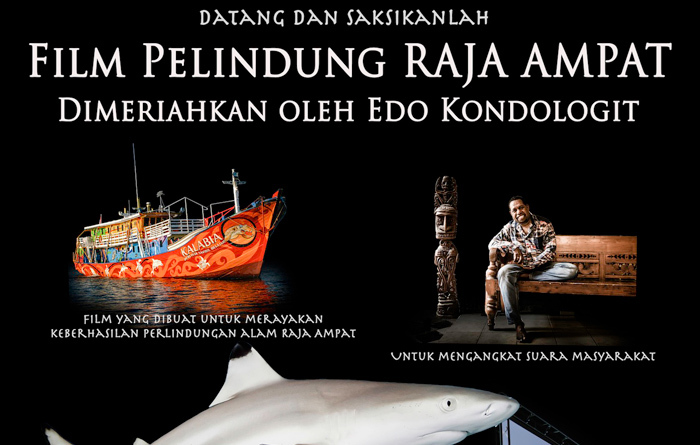 A Vision for Life in Raja Ampat has been translated from the original Bahasa Indonesia and clearly communicates the aspirations of Raja Ampat island communities. You can read and see more about the mission of the Kalabia on our Raja Ampat conservation programs page.